Originally priced at $100, Woman of the Year ticket prices dropped first to $50 — a deal reserved exclusively for Hasty Pudding Club members — before dropping again to $20 for all students on Jan. 30 after the award show failed to sell out. Club members seeking to attend the Man of the Year event still had to pay $250 for their tickets. This is not the first time the Pudding has priced Man of the Year tickets significantly higher than Woman of the Year tickets. Last year, Man of the Year tickets sold for $200 while Woman of the Year tickets were $80. 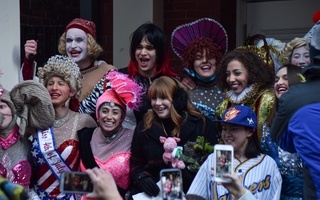 Hasty Pudding Theatricals President Grace C. Ramsey ’19 said the difference in ticket prices is due to the fact that the Pudding show's opening night will take place at the Man of the Year event. The Pudding traditionally produces a burlesque performance in which male actors dress in drag each year, according to its website. Last year, the group announced they would begin to accept female actors in their cast. Previously, women were able to hold positions on the group’s business, design, and tech boards, but they were not able to perform on stage — a decision that drew criticism in recent years. This year’s show, titled “France France Revolution,” will feature six women in its cast, ending nearly 200 years of male-only performances. Ishaan Prasad ’22, a member of the Hasty Pudding Club, said he believes one reason for the disparity in ticket prices is the timing of the official premiere of the show. “The ticket price might reflect the fact that the full show is being shown at the Man of the Year, versus at the Woman of the Year,” he said. “Additionally, there’s more alumni,” he added, referencing the fact that the Man of the Year event coincides with alumni weekend. In addition to the full show, the Man of the Year celebration will also include a roast, but not a parade, and the group is billing the occasion as an “extremely festive black-tie event that kicks off our alumni weekend,” according to the Pudding’s website. Ramsey also said Man of the Year tickets sold out even before the group announced they would honor Ventimiglia. “Alumni, patrons, and members of the Harvard and greater Boston community are excited not just to see our Man of the Year roast, but because they want to witness history and support the undergraduate women on stage,” Ramsey said. Hasty Pudding Club member Ryan R. Santos ’22 said the reduced ticket prices originally available to club members influenced his decision to purchase a ticket to the Woman of the Year event. Adam S. Levin ’22, also a member of the Hasty Pudding Club, said he thought the Pudding reduced ticket prices to ensure a full audience during Howard’s roast. ​Ryan Reynolds, a producer and Golden Globe-nominated actor known for his roles in many box office hits, will be the Hasty Pudding Theatricals 2017 Man of the Year.